I first came across Dirk Flinthart’s work when reading back over the New Ceres project, a shared world Australian spec fic project which occurred a while back. Dirk’s work featured in both the New Ceres Nights anthology and the stand alone Angel Rising (links are to my reviews of both). I enjoyed his stories in both, so when I saw he had brought out his first full length novel, I was intrigued. I also really liked the cover, to be honest. 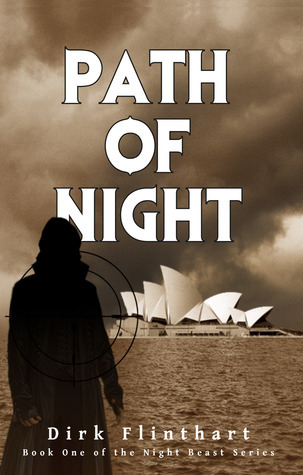 Iconic Australian imagery doesn’t often find itself on the front of an urban fantasy. The novel centres on medical student Michael Devlin, who works in a lab to help keep himself at university. He is accidentally infected with a mysterious substance and when he goes to ask the Professor running the lab what it was, a crazed killer breaks in and kills both the Professor and Michael. Which makes in all the more surprising for Michael when he wakes up in the morgue, toe tag and all. Not only is he not dead, but he seems to have picked up some nifty special powers along the way. The rest of the book involves Michael trying to work out what the hell has happened to him, and avoid/fight off the increasingly scary beasties that want to destroy him. The book moves along at a fair clip, and involves a series of increasingly large and violent action sequences. According to the Internet Flinthart is a highly experience martial artist, and that flavour comes through in the book. The fight scenes seem authentic, especially the hand to hand stuff. The story is told from several points of view, but my favourite is Jen, the Sydney police detective. She’s tough, smart and very pragmatic. She is also very relatable. This is the first book in a series, and while the plot does stand alone there is a lot of world establishing going on. I like the idea of international intrigue and secret cabals of vampires in an uneasy truce with their human counterparts, and the book hints at a scope that could make for very interesting story telling. That being said, the book is a lot of fun and my impression was that Flinthart was having a good time writing it. This impression was further entrenched when I heard the Galactic Chat interview of Flinthart, where he said “I had a good time writing it”. It is a very interesting interview – Flinthart has some pragmatic views on the publishing industry that I found informative. He even said that writing doesn’t need to be good in order to sell. Thank whatever deity you hold most dear that is the case, or my own writing career would be in a lot of trouble. Lots of action, violence and vampires – and you’re supporting Australian speculative fiction at the same time. What’s not to like? I recently read, enjoyed and reviewed New Ceres Nights, a collection of short stories set in the shared world of New Ceres. In a future where humanity has reached the stars, one planet choses to limit themselves to 18th century technology. I liked the collection, and have been keeping an eye out for further work set in the same world. Angel Rising by Dirk Flinthart is a novella set in New Ceres, focusing on one of the shared characters, George Gordon. Gordon is one of the few people allowed to used modern technology, as a part of a group of protectors (Proctors) that are deployed to foil plots that threaten the New Ceres way of life. In this novella he is off to the Sunrise Isles, where 18th century Japanese culture has been recreated. Inevitably he runs across samurai, ninjas and mystic warrior nuns, as well as a mysterious offworlder with amnesia and a lot of people looking for her. I enjoyed the novella, giving further insight into this shared world. I find it interesting how the same character is portrayed by different authors, same base characteristics but some real differences in characterisation. Flinthart’s writing is crisp and clear, with engaging action sequences placed at regular intervals in the plot. The plot was good – as the book is novella length it carries you along at a fair clip. In fact, the shortness is probably the only main issue I had with the work – there were times where I would have liked to see the plot expanded with more texture. If you’re interested in the New Ceres shared world, I’d probably start with New Ceres Nights. However, Angel Rising is an excellent next stop on your tour.